The Kendall mother charged with aggravated manslaughter in the death of her 11-month-old son had been diagnosed with postpartum depression soon after the baby was born, her attorneys revealed in court Monday. Catalina Bruno, 30, appeared in court Monday, where her attorneys sought to have an expert in postpartum depression evaluate their client. Bruno is charged in the death of Bryan Miguel Osceola, who died after he was left inside a car Thursday. A mother charged with aggravated manslaughter of a child in the death of her 11-month-old son was ordered held without bond Saturday. 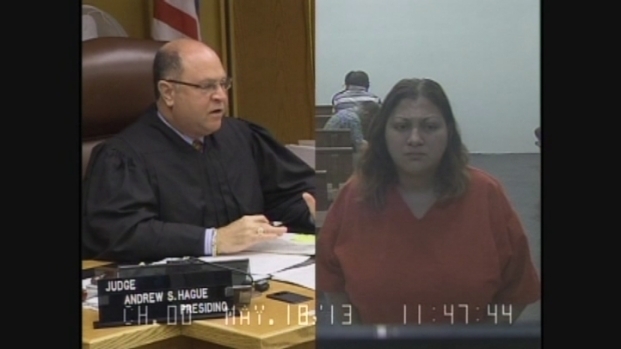 Miami-Dade Judge Andrew Hague ordered Catalina Marista Bruno, 30, held on no bond in connection with a previous case involving her son. He set her bond at $250,000 for the new case, and set numerous conditions if she posts bond. "She got prescribed medication nine weeks after the baby was born, unfortunately she was only given a month worth of medicine," said Bruno's attorney, Lonnie Richardson. Documents released by the Department of Children and Families don't show that however. "There is no indication in any of the notes that the protective investigator or the family intervention specialist ever heard the word postpartum depression," DCF regional director Esther Jacobo said. Law enforcement called DCF twice about Osceola's parents while the boy was still alive. The first time was in July when his father was arrested for domestic violence. The second time when his mother was arrested for DUI with the boy right next to her. Details of those two prior DCF investigations are contained in the newly released documents. Bruno was charged with DUI and child neglect in November when she was found asleep behind the wheel with her baby next to her. "CPI [Child Protective Investigator] spoke with dad and maternal aunts who explained mom did not drink regularly and no one realized how drunk she was when she left the family gathering," the DCF documents said. "The family intervention specialist after doing the evaluation determined that the mother, this was an isolated incident in terms of driving with the child and putting the child in danger," Jacobo said during an interview with NBC 6 South Florida. The child's father, Amos Osceola, was arrested on domestic violence charges last summer. "The parents got into an argument earlier in the afternoon in which the father left and went drinking at the gaming resort. The mother also started drinking while the father was away," the DCF documents said. After Bruno was arrested in November, no treatment or services were given to her by DCF, even though a rating tool used by investigators determined future risk to the child was high. "I'm sure the PI is thinking about it now in their own mind as I am," Jacobo said. "Would it have made a difference for us to put services in for the mother?" Bruno's arraignment date has been set for June 7.